An antibody-based theranostic agent could help provide diagnosis and therapy for malignancies expressing the cancer antigen 19-9. DENVER, Colo. (Embargoed until 9:30 A.M. MT, Tuesday, June 13, 2017) – Pancreatic cancer is associated with bleak five-year survival rates and limited treatment options, but new research is offering hope. A first-in-human study presented at the 2017 Annual Meeting of the Society of Nuclear Medicine and Molecular Imaging (SNMMI) demonstrates the feasibility and safety of the novel human monoclonal antibody HuMab-5B1 with highly specific targeting for the cancer antigen (CA) 19-9, which is expressed on pancreatic tumors and a variety of other malignancies, including small cell lung cancer and tumors of the gastrointestinal system. It holds the promise of better identifying tumors and directing treatment. The researchers evaluated the antibody with and without radiolabeling with zirconium-89 (89Zr-DFO-HuMab-5B1). With further validation, 89Zr-DFO-HuMab-5B1 could lead to a host of improvements in pancreatic cancer management—more accurate staging of tumors, better surgical guidance, restaging of metastases and potential drug selection for CA 19-9 targeted therapies. The high uptake of the antibody alone suggests that it could be used by itself, or radiolabeled, or coupled with another molecular compound to treat high-risk pancreatic tumors that are inoperable or metastatic. For this study, nine patients with CA 19-9-positive metastatic malignancies underwent a series of four whole-body PET/CT scans—one the first day of injection with the imaging agent, then again on day two and around days four and seven. Subjects also received a diagnostic computed tomography (CT) scan of the chest, abdomen and pelvis within the four weeks leading up to baseline PET/CT. Results of the CT scan were used to verify the results of 89Zr-DFO-HuMab-5B PET/CT imaging. Maximum standard uptake values normalized for body weight were analyzed for agent uptake in tumors. The agent was well tolerated and led to no serious side effects. Significant uptake was detected in local tumor recurrences as well as in metastases (for example in the lymph nodes, lungs, bone and peritoneum lining of the abdominal cavity). Uptake was analyzed for a total of 52 lesions. Highest uptake was shown on day seven in the lymph nodes. 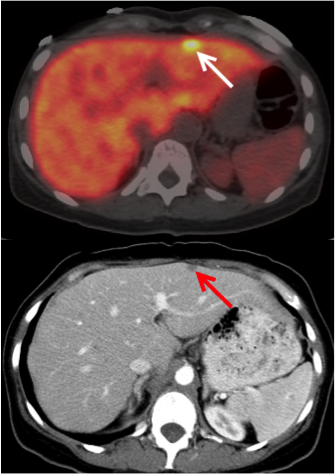 Results of the study showed that PET/CT imaging with the monoclonal antibody led to the detection of tiny tumors in the peritoneum and mesenteric lymph nodes that were not found by CT alone. Scientific Paper 385: “First-in-Human Study of 89Zr-DFO-HuMab-5B1 (MVT-2163) PET/CT imaging with and without HuMab-5B1 (MVT-5873) in patients with pancreatic cancer and other CA 19-9 positive malignancies,” Christian Lohrmann, Eileen O'Reilly, Joseph A. ODonoghue, Kenneth H. Yu, Neeta Pandit-Taskar, Serge Lyashchenko, Shutian Ruan, Jiong Wu, Phillip DeNoble, Jorge A. Carrasquillo, Charles R. Schmidtlein, Rebecca Teng, Maeve A. Lowery, Anna Varghese, Hayley Estrella, Memorial Sloan Kettering Cancer Center, New York, N.Y.; Wolfgang W. Scholz, Paul Maffuid, Jason S. Lewis, Wolfgang A. Weber, Memorial Sloan Kettering Cancer Center, New York, N.Y., MabVax Therapeutics Holdings, Inc, San Diego, Calif., SNMMI’s 64th Annual Meeting, June 10–14, 2017, Denver, Colo.